Also available in PDF and EPUB formats from Software Diagnostics Services. The full transcript of Software Diagnostics Services training. 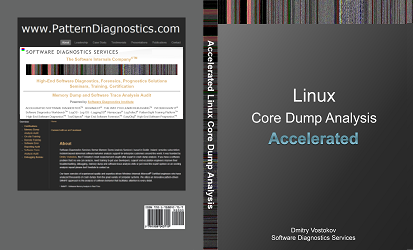 Learn how to analyse Linux process crashes and hangs, navigate through process core memory dump space and diagnose corruption, memory leaks, CPU spikes, blocked threads, deadlocks, wait chains, and much more. This book uses a unique and innovative pattern-oriented diagnostic analysis approach to speed up the learning curve. The training consists of 13 practical step-by-step exercises using GDB debugger highlighting more than 25 memory analysis patterns diagnosed in 64-bit process core memory dumps. The training also includes source code of modelling applications, a catalogue of relevant patterns from Software Diagnostics Institute, and an overview of relevant similarities and differences between Windows and Linux user space memory dump analysis useful for engineers with Wintel background.